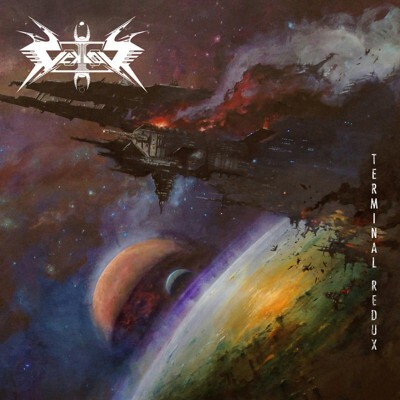 Jumping into this album without ever hearing a lick of Vektor’s material was entertaining and equally ear-crushing. The sound, often played at hyper-speed, has some slick production in its clarity, but the bass seems to get lost at times. Also, cranking out a full-length that clocks in at roughly one hour and 13 minutes makes it tough to hold any listener’s full attention. The majority of the time, Terminal Redux is filled with those hyper-speed sounds, coupled with a snarly, high-pitched, throaty, gruff vocal style that truly makes my eardrums start to hurt at only a few tracks in. I don’t mind an album that come across as a hard listen—it’s something that challenges me to maintain attention. With only a select few songs that I thoroughly enjoy, however—and despite the album’s intensity—I start to lose track of where I’m at on the album. This ship called Vektor mostly travels at hyper-speed, and only the beginning and the end of the record have the bulk of those speed breaks. It’s a double-edged sword for the band. I think giving the music more room to breathe would break up the speedy pace that Vektor set. I want the speed breaks from the band, mostly because they prog-out very well. From that well-paced starting cut to the highly acoustic track “Collapse” toward the end, the speed breaks almost soothe the ears that just got blasted. With a bit of an epic closing track, “Recharging the Void”—which is almost 14 minutes—is where I’m most captivated. The ending cut, while lengthy, does not get tedious or boring. While there is a lot of melody and a prog style that works well, there’s also a good bit of thrashing, but the clean vocals add a nice, spacey, weird vibe. In the end, I wound up struggling most with the album’s tracks that are fast just to be fast.